WoHooo for Halloween. I cannot wait to take Bridge and Joe and their pals out for some TOTing. Fun Times. Thanks for posting this Hals. Missed you in St. Louie too..hope to get together again next summer? Hugs, girl! I LOVED your video...almost made me cry. She is sooo adorable! My daughter was diagnosed 2 years ago 2 days after Halloween. It was so hard because everyone just assumed that she got diabetes from eating too much Halloween candy. Even now when we tell people when she was diagnosed they say that. It just goes to show you how ignorant people are of what this disease really is. We use Halloween as a way to celebrate making it through another year with Diabetes and she definitely still gets candy!!! Thanks for the post. I love the Switch Witch idea...I'm going to try it out! Just so great. 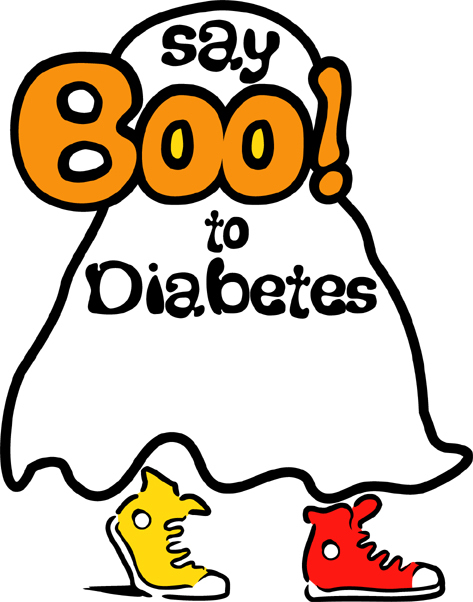 I came across your sight looking to say "Boo Diabetes" without it offending someone in our Diabetes Walk this year. I don't have diabetes, but I am a pediatric nurse who has had a lot of patients with diabetes. Going dressed like a bee and want to put on my shirt -- Honey Bee Bee says "Boo Diabetes!" Definitely doing it now. By the way, I am 50. My favorite story from my elementary years was "The Princess and The Pea." Maybe you and your daughter should start another project and actually write a children's book "The Princess and The Pump." I would most definitely buy it. I understand patents are not expensive and you could start small. I live in Mississippi. Lots of kids with diabetes here. terriburris@directv.net.